The Turtle Flip Weather Protect Heavy Mittens with Polartec WindBloc are 100% windproof, water resistant and very warm yet still breathable. Fabric face is treated with Durable Water Repellent to resist water but still soft inside and out. The seams are not waterproof for submersion in water. 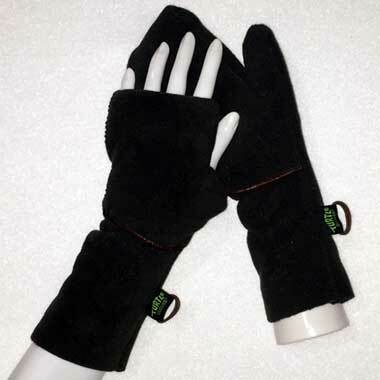 Recommended for below freezing temperatures, these weather protect mittens are perfect for outdoor activities such as running, dog walking, hunting, ice fishing and snowboarding. With a low-bulk flip over design, these Flip Mittens easily convert to fingerless mode without a floppy mitten piece. Available in Deep Woods Green with Brown Trim and Black. Machine wash warm. Tumble dry low or hang dry. Do not bleach. Do not dry clean. Do not use fabric softener.